Before his surprise resignation this week, Pope Benedict XVI may have lead the Church into one more scandal.Benedict is reported to have personally signed off on the Vatican Bank’s new president, German financier Ernst von Freyberg — new blood meant to head off recent financial scandals. A Church spokesperson was caught off-guard during the announcement of the new appointment today, however, when a reporter pointed out that von Freyberg chairs Blohm + Voss, a German firm that has supplied ships for the German military, reports the AP. The Vatican Bank traditionally avoids any link military manufacturing, so von Freyberg’s links to Blohm + Voss appeared to be a conflict of interest. The Church has attempted to sidestep the controversy, telling reporters that von Freyberg chairs a civilian branch of Blohm + Voss — but it’s hard to understand how the Church could have been unprepared for the harsh questioning of the hire. 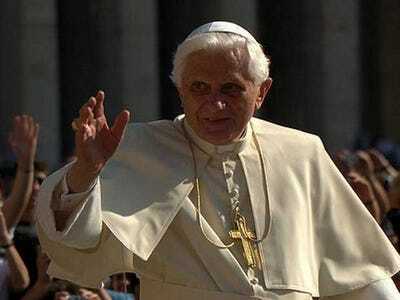 Benedict’s time as Pope has been marred with the scandals that besieged the Vatican Bank in the last few years, as a series of internal documents were leaked, earning the nickname “VatiLeaks”. The documents, allegedly revealed by the Pope’s faithful butler, revealed all sorts of conflict within the Vatican Bank, with allegations of cronyism and corruption going unpunished. The International Narcotics Control Strategy Report wrote last year that the the Vatican city was an area “of concern” when it comes to money laundering, and the Milan branch of JPMorgan Chase closed the Vatican bank account at the end of March 2012, citing a lack of transparency. Today’s embarrassment is just one more thing to mar the reputation of the Vatican bank.